Regardless of whether or not you're a regular viewer of WWE programming, I am going to highly recommend this past Monday Night Raw. I only want you to watch one match. Two hours of seven stories woven together that did more for these guys than any combination of singles matches, tag matches, promos, ambushes, debates, or whatever WWE tends to do to fill up their go-home show to a PPV weekend. It may seem counter-productive to take the seven guys who will all be part of a signature match at your upcoming Pay-Per-View. But in this particular case we see these guys under conventional rules in hopes of having momentum going into a brutal #1 contendership match, locked in the confines of (much more wrestler friendly) Elimination chamber. The star of this match was, by a landslide, Seth "Metal" Rollins. He went out there pumped and primed to showcase what he could do, no matter who was waiting for him in the ring. He starts against a rather taciturn Roman Reigns, all business and serious and how a Samoan Badass should be. This starting matchup is continuity - Seth and Roman have a minor beef stemming from the Rumble (Roman eliminated Seth) and the shared goal of main-eventing Mania. Roman has found his way there a couple of times, Seth also has one of the greatest Wrestlemania moments EVER by crashing Reigns/Lesnar at WM31 to cash in his briefcase. So as these two battle, we see a basic story of Roman trying to just run over Rollins, but the Architect countering with his speed and his wits. Signature moves were countered; Rollins flew in, out and around the ring. Roman tried to power through but not only did he NOT land a Spear, Rollins rolled him up! That's 20 minutes done, where we got a showcase of Roman's power but potential lack of focus of the match in front of him. His eyes might not have been completely on the ball, thinking about his first ever Chamber match and looking all the way out to Mania. Seth out-wrestled and out-smarted his brother in arms. It's worth it for Roman's "Aw man, you got me! WTF?" face after that. One "No hard feelings" Shield fist bump before the telltale trumpets sounded. Now let me see if I have Cena's story straight - he's hell-bent on going to Wrestlemania this year and thinks that he HAS to win the chamber to do that? Is it "I know I'm doing all this other stuff, but Mania is my focus?" Is it "I don't know how many Manias I have left in me?" And the thought that he has to go through a nearly "unwinnable match" with the Chamber (this is his 7th, he's 3-3, winning once from the first position) to face a near-invincible Brock Lesnar(that he's beaten in the past)? Just relax, Johnny boy, I'm sure someone will be interested in losing to you at Mania. Seth is well aware he can't match power with Cena. He'd already been through one power match against Reigns and really didn't want to have to do that all over again, so he jumps "Big Match John" to try and surprise him. That never works. Despite the fast start, Cena isn't someone who does a lot of rapid-fire attacks in return, giving Seth a breather here and there as they exchange offense and potential count-outs. Cena's methodical approach allows Seth to get his legs back under him and after being pinned on a punch, Seth Metal is seething! A flurry of offense later, we watch Seth and John put each other in submission holds, Cena dodging the Curbstomp and Rollins kicked. out. of. the. Attitude. Adjustment. Then Rollins STEALS the AA - and even does the roll-through reverse! At this point I was looking at my hands to make SURE I wasn't playing 2K18. Then what does he do? He escapes a double AA and CURBSTOMPS Cena! AND PINS HIM! And there was much celebrating - not from just the fans, even the announcers for once were invested in the actual match. Sure, they talked about Chamber history (HHH's injury from the first one), the other participants (given that Seth, Finn, Roman, Braun and Elias have not been in one) but they were talking about Rollins and what he was putting himself through. That I found absolutely refreshing. Rollins is still flat on the mat when Elias hurries out for a quick pin. 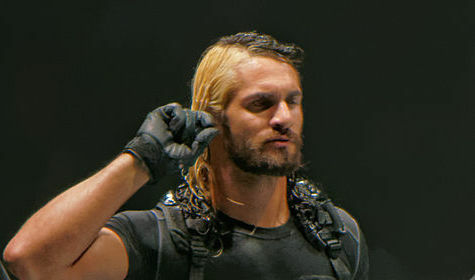 Rollins STILL kicks out! It might sound/feel ludicrous, but the crowd is still invested, especially since Rollins has taken care of the two "Golden Boys" and is now at the mercy of the dark horse in this race (and one heck of a heel despite people liking his music) Elias. The crowd doesn't have anything against Elias and reacted to him pinning Rollins, but just as much as Rollins was worn out with this in-ring marathon. Rollins was in that ring over an hour, He got a standing ovation for his work, a "Thank you Seth" chant, and a sign of approval from the next opponent, Finn Balor. When Seth is interviewed (once he's caught his breath and gotten some water) he still sounds driven. He still sounds determined. Despite his performance tonight, what does it mean if he doesn't win the Chamber? Win or lose, Seth, you got a lot of fans and respect out of it. This should not take away from Balor's performance in the ring, dispatching Elias quickly and having to contend with Miz and the Miztourage. The A-lister stole his win thanks to his compatriots, only to receive an immediate karma hammer of the last entrant Braun Strowman(it's even more fun watching Miz realize what's about to happen). The Monster among Men mangled Miz and his minions to the delight of the crowd, bringing this affair to a satisfying close. Going into Sunday, what's WWE to do? Am I reading too much into Rollins having a new shirt that they're going to ride this high to let him face the Beast? There's continued mention of the title Balor never lost, do they pull that trigger? Braun Strowman and Elias have strong followings, do they take a chance? Miz has been killing it on the mic and in the ring for over a year, is now his time? Or does WWE play safe and give it to Roman or Cena?